By giving the Swaminarayan Mahamantra, Purna Purushottam Bhagwan Swaminarayan has provided a means by which countless souls can be free of worldly miseries. He has blessed that those who chant this divine mantra will be granted ultimate salvation. Chanted in the early morning, when the melodious singing of birds and the trickling sound of life-giving water in the streams welcome the new dawn, this mahamantra provides a truly unmatchable divine experience. 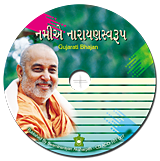 Added to this, to hear Pramukh Swami Maharaj, whose life is an embodiment of the mahamantra, chanting this divine mahamantra is a truly spiritual experience. This audio publication provides such an experience.